Good News For Elephants: China's Price Of Ivory Has Plummeted : The Two-Way Africa's elephants have been poached by the thousands for their tusks. Many of those tusks are then smuggled to China, one of the largest markets for the banned material. 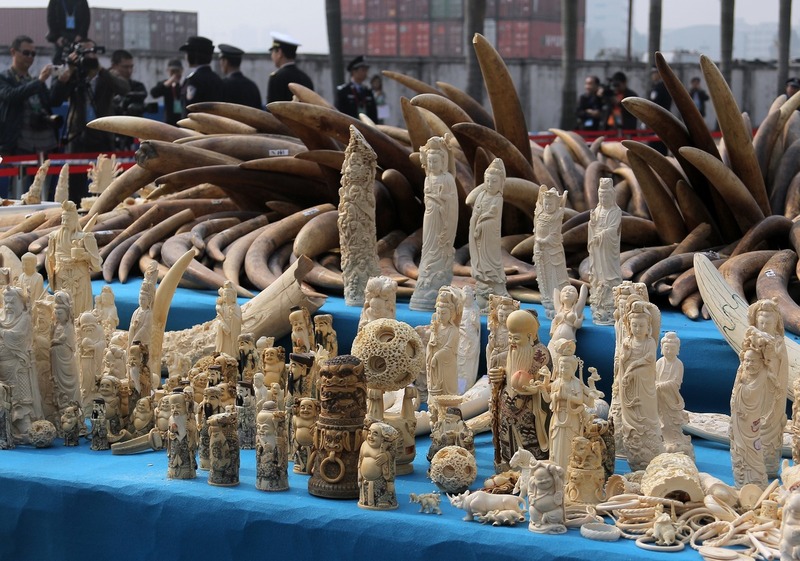 Ivory is displayed before being crushed during a public event in Dongguan, southern China's Guangdong province in January 2014. As China prepares to impose a domestic ban on the ivory trade, a new report has found that the price of raw ivory there is plummeting. It's good news for Africa's elephants, which have been poached by the thousands for their tusks. Many of those tusks are then smuggled to China, which has been one of the world's largest markets for the banned material. The Save the Elephants researchers found that the wholesale price in early 2014 was $2,100 per kilogram; by last month, it had dropped to $730 per kilogram. There are a few reasons behind the price drop, the conservation organization wrote in a press release. "An economic slowdown has resulted in fewer people able to afford luxury goods; a crack-down on corruption is dissuading business people from buying expensive ivory items as 'favours' for government officials, and the Chinese government has made a strong commitment to close down the nation's legal ivory trade," Save the Elephants said. China made the announcement last year after years of pressure from environmental groups. As NPR's Chris Joyce has reported, U.S. and Chinese officials have been negotiating an end to China's domestic ivory trade since 2015. At the time of the announcement, environmentalists hailed it as a crucial move that could prevent elephants from becoming extinct. But even before the 2016 announcement, the ivory market was in decline in China, the researchers found. For example, the researchers said in their report that legal retailers in Beijing and Shanghai had dwindling stocks and were trying to diversify the materials used in their products. Those involved in the legal ivory trade were "gloomy" about the future of the market. Illegal traders of ivory that the researchers spoke with were comparatively less concerned about the new regulations. However, some were now keeping ivory at more discreet locations in their shops, or had started selling ivory online instead. Some carvers have turned to the tusks of prehistoric mammoths as an alternative, the report said, but the ivory is of comparatively lower quality and therefore less appealing to the traders. A major census of African elephants recently reported that between 2007 and 2014, the African elephant population decreased by nearly a third, as The Two-Way has reported. The report concludes with a major question that remains — what will happen to China's illegal ivory market, once the legal market is officially closed? "Will demand for illicit ivory items go up or down?" the report asks. "Will prices rise or fall? Will carvers continue to produce ivory items in larger or smaller quantities illegally?" However, it says it's clear that China has experienced a "major turning point to close down China's ivory industry." That's worth applauding, says Save the Elephants President Iain Douglas-Hamilton. "With the end of the legal ivory trade in China, the survival chances for elephants have distinctly improved," he said. "We must give credit to China for having done the right thing by closing the ivory trade. There is still a long way to go to end the excessive killing of elephants for ivory, but there is not greater hope for the species."